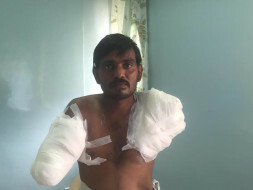 Help Rama Subahiah to undergo treatment for his burnt hands. Rama Subaiah works in the electricity department as a lineman. He hails from Anantapur district in Andhra Pradesh. In an unfortunate incident, he suffered severe burns. There were heavy rains and he was on duty, repairing. The mains were switched on and he suffered severe burns. Both his hands have been amputated now. He is the only earning individual in the family. His wife is a daily-wage labourer. He has two young daughters to look after as well. 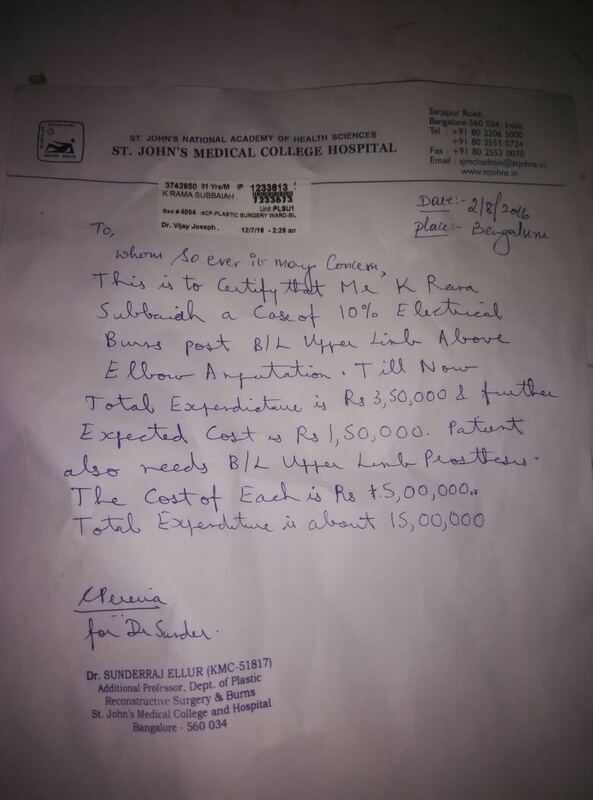 The estimated cost of his treatment is around Rs 15,00,000. Rama has no money left to continue to the treatment and has been discharged from the hospital. He is coming in for checkups. The electricity department has given him 2 lakhs. Unfortunately, he is not entitled to get an insurance. The family has no financial backing and there is no way they can raise this amount. The treatment has to be completed in the next 30 days he has to undergo couple surgeries further. Seeking your urgent help. Thank everyone for supporting Rama's Campaign, Rama has recovered now and he will very soon resuming his job as well. Rama at the moment is going through his post recovery training sessions. I am Sudhakar, a Milaap Open fellow in Bengaluru. I met with Rama Subbiah and his wife, Radhamma at St. John’s Hospital last month. I have also been in touch with the champion constantly. Rama was rushed to St. John’s Hospital, Bengaluru within a few hours of the occurrence of the accident on 12th July. 5 procedures for the left arm and 1 procedure for the right arm had to be carried out for the amputations. Rama’s blood group A- is a rare one, because of which it was tough to find donors. He was in the ICU for the entire month of July during the recovery period post the operations. He was under antibiotic treatment for sepsis till August. He also has a burn injury on his left thigh for which he is undergoing treatment. Rama visited Dr. Sunderraj Ellur on 21st September for a check-up. Rama’s wounds are recovering well. Based on his recovery speed, Dr. Sunderraj Ellur has advised that he might not need skin grafting or reconstructive surgery, which was the plan initially. He has been asked to visit the doctor on 1st October for the next check-up. Prosthetics for his arms will be attached based on further review of his recovery. This is estimated to happen in approximately 3 months. Radhamma and Rama have 2 daughters, Likhita and Swapna, 5 years old and 3 years old respectively. Rama’s brother-in-laws Linga and Hari Krishna have been a source of constant support for the family through this tough period. They have settled bills of Rs. 4.1 lakhs with the hospital with the help of the funds contributed by the staff of the department and by borrowing from friends & family. Additionally, they have had to spend Rs. 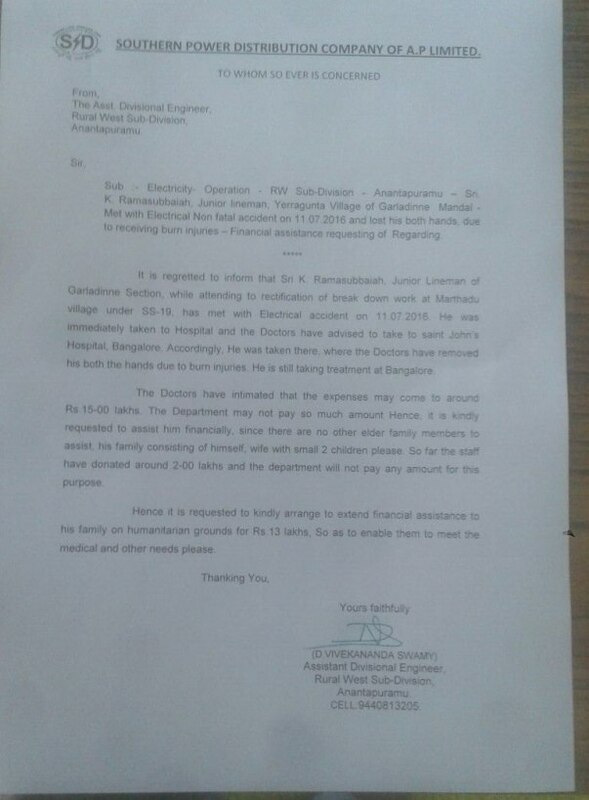 2 lakhs for travel, stay at Bengaluru and miscellaneous expenses. The family members are still holding discussions with the electricity board to fund the expenses towards the procedures. We will keep you posted in case of any significant development in the matter.